Home Recruitment TS JOBs TS Police Constables Recruitment TS Police Recruitment Board TSLPRB TS SI, ASI, RSI, Police Constable Posts Recruitment 2018, How to Apply? TS SI, ASI, RSI, Police Constable Posts Recruitment 2018, How to Apply? #TSLPRB - TS SI, ASI, Police Constable Posts Vacancies for Police Recruitment 2018: Government of Telangana issued the notifcation for filling of 18,438 vacant posts through Direct Recruitment and T Govt gave Permission to the Recruiting Agencies for recruitment of above said posts. 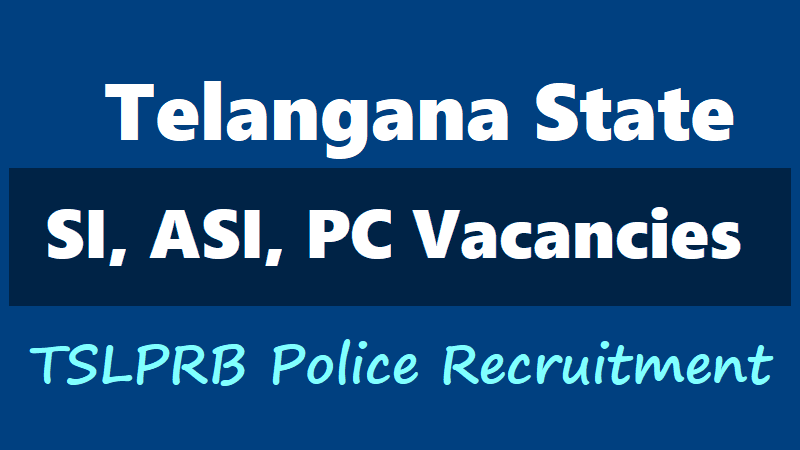 In this connection, SI, ASI, RSI, Police Constable and other posts will be recruited through Telangana Sate level Police Recruitment Board(TSLPRB). This process should complete in few days.In this subject Telangana State Level Police Recruitment Board has given issue the SI, ASI, RSI, Police Constable and other posts 2018 Recruitment notification in this month and Exam Pattern, Syllabus, Schedule and Eligibility Criteria will be announced by TSL Police Recruitment Board. These posts fill up through direct recruitment by PRB. Apply to 18,428 TSLPRB Constable, SI before June 30 on tslprb.in: Telangana State Level Police Recruitment Board, TSLPRB has invited online applications for the recruitment of 18,428 individuals at Sub-Inspector and Constable posts. The last date to apply online on tslprb.in is June 30. Steps and direct link to apply online to Telangana Police Recruitment 2018 along with the official advertisement have been given below. Minimum age to apply is 18 years as on July 1, 2018. Minimum educational qualification is Class 12 pass or equivalent. The application fee is Rs 800 for each post. For Stipendiary Cadet Trainee, SCT Police Constable (Civil) (Men & Women) in Police Department, 5909 posts are available. SCT Police Constable (AR) (Men & Women), 5273 posts are open. 4816 posts are open for men for SCT Police Constable (TSSP) position. For the post of SCT Police Constable (Information Technology & Communications) in Police Department, there are 142 vacancies for both men and women. For SCT Police Constable (Mechanics) in Police Transport Organisation, there are 19 positions open only for men. For SCT Police Constable (Drivers) (Men) in Police Transport Organisation, 70 vacancies are there. Step 1: Log on to tslprb.in using the direct link given here. Step 2: Click on Apply online from the top menu. Step 3: Direct link to official notificationIf already registered to the website, proceed to logging in to the portal by entering mobile number and password. Step 4: If not, sign up by entering all the required details. Step 5: Get on with the online application after successfully completing the registration. Step 6: Make payment and save or print the online application for future reference. a) Must have attained the age of 18 years and must not have attained the age of 22 years as on 1st July, 2018 i.e., must have been born not earlier than 2nd July, 1996 and not later than 1st July, 2000.
b) For Home Guards, a Person who, as on the date of notification, has been on duty as Home Guard for a minimum duration of 360 days within a period of two years and who is still continuing his service as Home Guard, must have attained the age of 18 years and must not have attained the age of 40 years as on 1st July, 2018 i.e., must have been born not earlier than 2nd July, 1978 and not later than 1st July, 2000.
vi. For the Post Code Nos. 26, 27 & 28 : Must have attained the age of 18 years and must not have attained the age of 30 years as on 1st July, 2018 i.e., must have been born not earlier than 2nd July, 1988 and not later than 1st July, 2000.
a) Candidate if she is an SC or ST, must have attained the age of 18 years and must not have attained the age of 40 years on 1st July, 2018 i.e., she must have been born not earlier than 2nd July, 1978 and not later than 1st July, 2000.
b) in the case of all other categories other than SC & ST, the Candidate must have attained the age of 18 years and must not have attained the age of 35 years as on 1st July, 2018 i.e., she must have been born not earlier than 2nd July, 1983 and not later than 1st July, 2000.
xi. For Home Guards, a person, who as on the date of Notification has been on duty as Home Guard for a minimum duration of 360 days within a period of 2 (two) years and who is still continuing his service as Home Guard, must have attained the age of 18 years and must not have attained the age of 40 years as on 1st July, 2018.
i. For the Post Code Nos. 11 to 19: The Candidate must hold, as on 1st July, 2018, a Degree awarded by any University in India, established or incorporated by or under a Central Act, Provisional Act of State or of any Institution recognized by the University Grants Commission or any other equivalent qualification. In the case of a Candidate belonging to Scheduled Castes or Scheduled Tribes, as on 1st July, 2018, he / she must have passed Intermediate or any other examination recognized by the Telangana State Government as being equivalent to Intermediate and should have studied 3 years Degree course. ii. For the Post Code Nos. 21 to 28: Candidate must hold, as on 1st July, 2018, a pass Certificate in Intermediate or its equivalent examination recognised by the State Government. In the case of a Candidate belonging to Scheduled Castes or Scheduled Tribes, as on 1st July, 2018, he / she must have passed SSC or its equivalent examination recognised by the State Government and should have studied Intermediate and appeared for the Intermediate Examination in, both the 1st year and 2nd year. iii. For Post Code No. 31: Must possess the Degree of B.E. / B.Tech. in Electronics and Communication Engineering OR Electrical and Electronics Engineering OR Computer Engineering OR Information Technology OR a qualification approved by the State Government as equivalent to any of the above as on 1st July, 2018.
iv. For Post Code No. 33: Must possess a Degree with Computer Science OR Computer Applications OR Information Technology as one of the subjects awarded by any University in India established or incorporated by or under a Central Act, Provisional Act of State OR of any institution recognised by the University Grants Commission as on 1st July, 2018.
vi. For Post Code No. 35: Must possess pass in SSC or any other examination recognised by the State Government as being equivalent to SSC and must possess an Industrial Training Institutional Certificate in Wiremen OR Mechanic Motor vehicle OR Mechanic Diesel OR Fitter as on 1st July, 2018.
vi. For Post Code No. 36: a. Academic Qualification: Must possess pass in Intermediate examination or any other examination recognised as its equivalent by the State Board of Intermediate Education; (or) SSC or any other examination recognised by the State Government as being equivalent to SSC and must possess an Industrial Training Institutional Certificate in Auto Electrician OR Mechanic Motor vehicle OR Mechanic Diesel OR Fitter as on 1st July, 2018 b. Technical Qualification: Must have possessed either Light Motor Vehicle (Transport with Badge Number) or HMV License, or both put together, continuously for a period of full two years and above as on date of notification Candidate should furnish the Driving Licence information (Grant of issue of Driving Licence), issued by the Licensing Authority of the RTA concerned along with the Application Form. Note:- Candidates who possess higher qualification than the prescribed one will also be considered on par with the Candidates who possess the prescribed qualification paid at TS Online / AP Online / MeeSeva (e-Seva) Centres / through Payment Gateway (Credit Card / Debit Card / Internet Banking). Note:- Candidates have to fulfil the eligibility criteria laid down in the relevant GOs issued by the Government from time to time. How to apply: Candidates should submit the Online Applications through Telangana State Police Web Portal www.tslprb.in. 4. Once the candidate submits the application, no corrections can be made. Hence candidates are requested to carefully verify the details before submission.